Holidays honoring parents have become official only in the 20th century, even though somewhat similar recognitions were customary in ancient times. Father's Day in particular was not officially recognized as a national American holiday until 1972, after acceptance slowly grew from its initial observances in the early 1900s. Biblically, it is surely fitting to have special days to express love and gratitude for our parents. After all, the fifth of God's Ten Commandments begins, "Honour thy father and thy mother" (Exodus 20:12), and was further affirmed and even strengthened through the apostle Paul when, in honoring and obeying our parents, we are promised "it may be well with thee, and thou mayest live long on the earth" (Ephesians 6:3). So this month as we celebrate fatherhood, it is fitting to ask: What does it take to be worthy of such honor? Biblically speaking, Christian fathers are exhorted to "train up" (Proverbs 22:6) their children in an environment of "nurture and admonition of the Lord" (Ephesians 6:4), which naturally begins with the father’s own commitment to godly leadership and godly living. 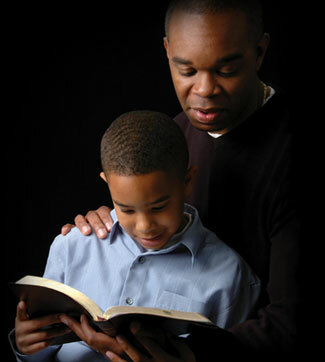 Perhaps the greatest incentive for godly living is the example fathers set for their own children. From King Solomon we know that "children's children are the crown of old men; and the glory of children are their fathers" (Proverbs 17:6). Therefore, children do indeed receive "glory" from their fathers and should desire to follow in their footsteps, especially with reference to their moral and spiritual examples. One of the many joys of fatherhood is not only to have children, but, Lord willing, to see one's grandchildren as well. Most honorable men will also work hard to be able to leave an inheritance to their children and, through them, to their grandchildren. "A good man leaveth an inheritance to his children's children" (Proverbs 13:22). Circumstances may not make it possible for fathers or grandfathers to leave a material estate to their descendants. Therefore, promises such as these must ultimately be understood in the spiritual sense. Even a poor man can leave a goodly inheritance--an inheritance of love and concern and a godly life. The greatest of all gifts to pass on to your children, of course, is to lead them to saving faith in their Creator, the Lord Jesus Christ. This most precious heirloom will last forever. So in this sense, even men who are biologically childless can have spiritual children as they witness for Christ. Paul, for example, could call Timothy "my dearly beloved son" (2 Timothy 1:2), and he could remind the believers at Corinth that "I have begotten you through the gospel" (1 Corinthians 4:15). Then, what further joy is ours when someone we have led to Christ begins to lead still others to Him! These become our spiritual "children's children" in the great family of God, and such spiritual grandchildren constitute a most beautiful "crown" of fatherhood! Through the years, the ministry of ICR has equipped countless multitudes of fathers and grandfathers (and mothers and grandmothers, too!) with the tools necessary to lead their families in a godly manner. Perhaps our work has personally touched you in this manner, or, like me, you have had the tremendous privilege to "glory" in the inheritance passed on by a godly father and grandfather. If so, ICR prayerfully invites your help to ensure that the work for our ultimate heavenly Father will continue. Cite this article: Morris IV, H. 2009. The Crown of Fatherhood. Acts & Facts. 38 (6): 21.